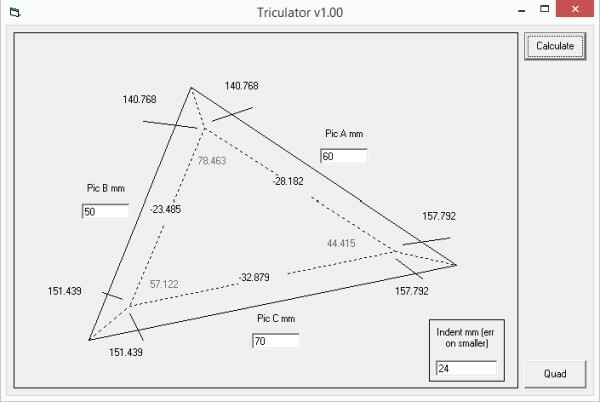 Triculator is simple software to calculate the correct angles and lengths of framing wood for irregular triangle and quadilateral paintings. If you've got a triangular painting (or a trapezoid, or other irregular shape) you can type the lengths of the sides of the painting into this program, and the indent/rebate (rabbet) in your framing wood and the correct angles and lengths to saw will be calulated and returned. The program was written in Microsoft Visual Basic 6 and is supplied here as a simple exe without an installer. You might get a request for some dll files when you first run the program. If so, these will be free Microsoft downloads, do a quick Internet search for them and put them in the same folder as the main program.